Nineteen year-old Stephanie presented with a cosmetic problem that is very common, though quite difficult to treat: a chipped tooth. A chipped tooth is bad enough, but unfortunately for Stephanie, she had a chipped tooth in the worst possible area – right at the front of her mouth. Stephanie chipped the tooth while snacking on a boiled lollie and she immediately rang dHealth Dentistry to see if we could fix this cosmetic dentistry nightmare. 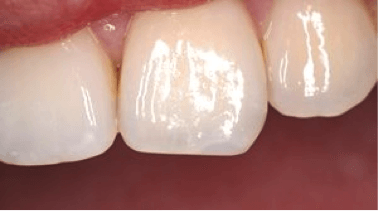 Front teeth are one of the hardest to match cosmetically when using composite bonding material. 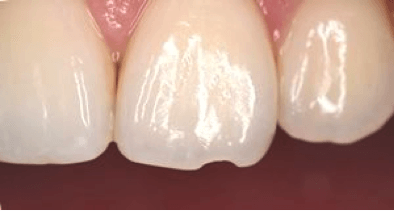 It is important to create the right mix between depth and translucency, as well as to match the colour of the tooth so that the composite is indistinguishable form the tooth itself. It’s also important to shape the composite material, so that the fixed tooth matches aesthetically with the surrounding teeth. Step 1: First, we examined Stephanie’s teeth extensively, gaining an understanding of the colour and shape of the surrounding teeth. Step 2: We then used our expertise and experience to select the composite bonding material that most closely matched the colour of Stephanie’s teeth. We compared the material to the affected tooth so that Stephanie could check on the suitability of the material we had selected. Step 3: We then created etching on the surface of the area to which material would be applied. Once the material had bonded with Stephanie’s tooth, we began to shape and mould the material so it would most closely match the shape of the adjacent teeth. An intensive light source was then applied to make the bond even stronger. Step 4: After just one appointment, we were able to treat Stephanie’s chipped tooth. Stephanie was amazed with the finished product and remarked that even she found it impossible to tell the difference between the composite and her actual tooth. What seemed like a disaster ended up being a problem that the expert team at dHealth Dentistry in Melbourne could fix in just one appointment, with no pain and no needles required.